Pro Care provides critical care, emergency, and inter-facility ambulance and medical services to the people of greater Atlanta. Patient care is our number one priority. Our 100+ employees are proud to provide service to the patients of eight Atlanta area hospitals as well as numerous nursing homes and hospices. Pro Care provides both basic and advanced life support to patients requiring medical care during their transports. All of our paramedics and EMTs are fully licensed and certified in the state of Georgia and each of them participates in regular training and professional development. Pro Care is also the ambulance and emergency medical service provider for the the Susan G. Komen Breast Cancer Walk, the Peach Drop, the Atlanta St. Patrick's Day Parade, the Run the Reagan, and the Fallen Heroes of Georgia 10k. 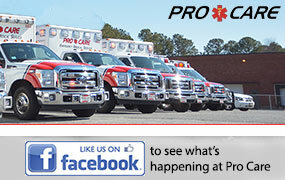 Pro Care is also proud to have established itself as the leading provider of EMS services and ambulances to Atlanta's rapidly growing film industry.